Grand Army Plaza, Brooklyn. Sources from top left: s p1te; DS.JPG; wirednewyork & ennead architects; Poulin + Morris; Prospect Park Alliance. The 2013 addition to Brooklyn Botanic Garden’s Native Flora Garden can be found just down a stunningly busy “parkway” from the borough’s symbolic hub, Grand Army Plaza. Originally designed in 1867 by Olmsted and Vaux as the pivot point where their pastoral Prospect Park would meet a densely urban neighborhood, the Plaza has undergone dozens of monumental additions, all the while also serving as the biggest and busiest traffic circle in the entire City. Major institutions like the Brooklyn Museum, Public Library and Brooklyn Botanic Garden (BBG) were added to the Plaza in the late 19th and early 20th centuries, anchoring its role as a crossroads of culture and everyday life. Today, the Plaza embodies Brooklyn vitality at its bluntest – high profile design for landscape, urban spaces and architecture, all thrown together with fine arts and diverse neighborhood life. It is the counterpoint to Manhattan, where the boundaries separating these disciplines are usually more strictly enforced. The neighborhood is an apt setting for Darrel Morrison’s new garden, the first addition to the century-old Native Flora Garden and part of the BBG’s Campaign for the Next Century, a comprehensive expansion program to bring more visitors in and to reach even further out into Brooklyn’s diverse neighborhoods. 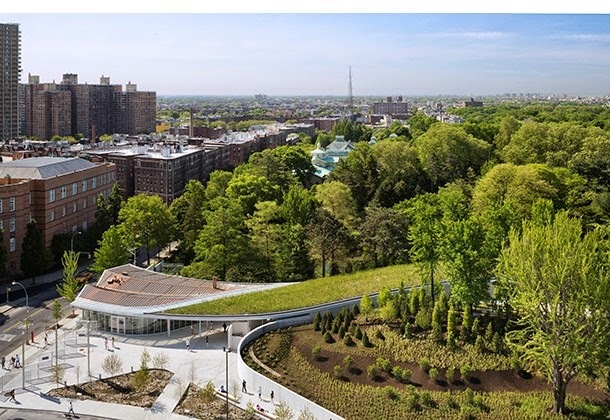 Set immediately alongside the original century-old Native Flora Garden, the addition reflects a pride and protectiveness of the Borough’s natural history, and a view forward into the way art, design and life will continue to merge so casually in Brooklyn. The BBG addition is also an auteur work, to borrow a phrase from Cahiers du cinéma, the 1950’s Paris-based journal in which film critic André Bazin first proposed the idea that great films, like great paintings, must be understood within the context of their creator’s style, traceable as it develops from film to film – thus qualities like Hitchcockian, Truffaut-istic and John Ford-inspired. Darrel Morrison is a man whose personal kindness and unassuming manner is at odds with this kind of top billing. Hardly a Devo, Darrel happily adapts to the goals of his clients, even when it means working double-time to capture the essence of multiple plant communities in a very limited space and making it all look natural. He agreeably rationalizes the presence of a giant English Oak (Quercus robur) in an otherwise strictly native garden, crediting its longevity and the fact that it looks a lot like the native Bur Oak (Q. macrocarpa). He’s even willing to look the other way when a pretty “nativar” pops up in a garden or a conversation. Darrel retired five years ago to focus on design, after a long career teaching and serving as administrator for programs as diverse as the Landscape Architecture Department at the University of Wisconsin and the School of Environmental Design at the University of Georgia. Today he is one of the enduring champions of ecological restoration, sustainable design, and nativism. A recent transplant to New York City, Darrel has worked for years with the region’s native species, including his meadow-size sweeps at the 500 acre Storm King Art Center, an hour north of the City. His graceful hillside design at The New York Botanical Garden turns a marginal space abutting the historical “Stone Mill” (Pierre Lorillard Firm, c 1940) on the Harlem River into a luscious, rolling design destination in its own right. And he also turned a dingy alleyway in one of New York University’s least interesting corners into a vivid shade garden at the foot of the colossal red sandstone Elmer Holmes Bobst Library (Philip Johnson and Richard Foster, 1972) with species that flourished in the same area before Europeans. All of this work would bring most designers to some polemical stance or another. So why is Darrel so nice? After hearing him lecture and having the opportunity to talk one-on-one with him this winter, it occurs to me that, before anything else, Darrel is first a teacher, and he knows a secret that many nativists and ecologists overlook – that scolding or preempting or browbeating win few hearts and minds. It may also be his most complex design to date, a quality that Darrel told me is central to his work. “I first realized how much I was attracted to complex plants and combinations when I was a student at the University of Wisconsin’s Landscape Architecture Program, taking as many ecology courses as I could. Both as a grad student and then a faculty member there, I was greatly affected by the time I spent in the field, notably in native prairies. They are the best classrooms possible for developing an eye for complexity,” Darrel told me. Complexity is certainly a dominant note in Darrel’s BBG addition. In late winter, it is a subdued, chiaroscuro of line and texture. The addition to the BBG Native Flora Garden addition, January, 2014. Source: H. Wade. Summer will bring the garden’s complexity to an energizing, synesthetic pitch – tactile because the Garden’s pathways are of an intimate enough scale to give you at least the sense of brushing against the Little Bluestem (Schizachyrium scoparium) and Hyssop-Leaf Boneset (Eupatorium hyssopifolium) – aromatic because of the two Asclepias species, Swamp milkweed (Asclepias incarnata) and Butterfly Weed (A. tuberosa) – fragrant because of the Wild Saraparilla (Aralia nudicaulis) that drifts throughout the garden, in season – visual in the contrasts that occur between hazy grass masses and loser drifts of dense Prickly-Pear Cactus (Opuntia humifusa) and Deerberry (Vaccinium stamineum) – aural because of the multiple layers of wind rustlings, insect buzzing, birds singing and cars and busses passing, all Brooklyn natives. Artist renderings of the BBG Native Flora Garden addition, 2013. Source: Brooklyn Botanic Garden. In fact, the complexity would seem overwhelming if it were not for a few design gestures that tie things together – a secondary path rounds up to a modest circular clearing at the top of the hill, providing a friendly negative space amid the crowded meadow and a vantage point to see other unifying elements. There are the drifts of Pixi Moss (Pyxidanthera barbulata) and drifts only suggested by repeating Panicled Dogwood (Cornus racemosa) and still small Eastern red Cedar (Juniperus virginana). There is also the carefully exposed sand that works as a unifying matrix around the garden’s center of gravity, a quieting pond. The BBG Native Flora Garden addition, 2013. Source: Brooklyn Botanic Garden. Also unifying the complexity is the weathered gray boardwalk, which arcs roughly across the garden, sliding along one side of the pond. It is a graceful boardwalk, smooth and comfortable rather than modernist and sleek. “The primary path and boardwalk that accounts for the garden’s circulation also emphasize the separateness of the hillside and the lower area. These are importantly separate areas, very different effects with airy movement of the meadow grasses and the more grounded, sandy plant communities below. But I think the experience is that you flow between them easily,” Darrel explains. Immediately next door to the garden addition is the Native Flora Garden, descendant of the original “Native Flora Section” that was the first priority of founding Director and nativist, Dr. Charles Stuart Gager, who started to lay it out almost immediately after BBG opened in 1910. Gager patterned the section as a series of carefully organized collections of woodland plants from the region, arranged by taxonomy, species after related species, along the path in the “botanic” fashion of the time. It was the same model that filled natural history museums of the day with precisely pinned insect collections in vast glass-top cases illustrating the similarities and evolutionary differences between species. The original BBG Native Flora Garden. The original taxonomic layout (left); present day entrance and pathway. Sources: Popular Science Monthly, Volume 80, 1912; H. Wade, 2013. It was only in the 1920s, as European ecological ideas about interrelating plant communities began to influence American curatorship that the BBG reorganized the garden into nine separate, regionally native plant ecosystems. The idea was to create holistic representations of the natural habitats like the “living history exhibits” and “tableaux” that had replaced glass cases in museums of the time, amusement park style experiences, hyper-realistic representations of the originals. Two generations of teaching exhibits, side by side, not unlike the BBG Native Flora Garden addition. 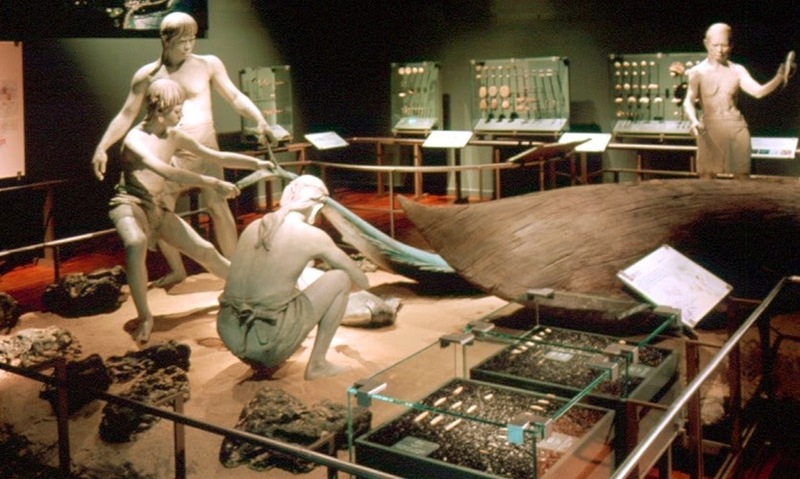 Source: National Museum of Prehistory. Today’s addition to the Native Flora Garden exists in a middle ground between these two styles and pedagogies, and the resulting lack of simplicity gives the garden a slightly radical kind of self-awareness. If we want to explore Darrel’s design “style,” then getting to the heart of this two-point harmony of the BBG addition is key. Morrison’s designs for the Stone Mill at New York Botanical Garden (left), The Storm King Art Center, and the NYU Schwartz Plaza Native Woodland Garden. Not a unifying style to be seen. Sources: christinedarnelldesignstudio; Michitecture; NYU Alumni Magazine, May 7, 2010. One problem with discussing design style is that we tend to focus on a signature “look.” That’s an Oudolf, not a Stuart-Smith; a Jekyll, not a Farrand. It can be a deeply satisfying exercise for plant people, nerdily addicted to getting field identification right. But connecting-the-looks doesn’t work with some designers, like Darrel. “My gardens are different from one another because I design to the places where each one occurs,” he simply explains. I would add that his highly adaptable approach to clients probably furthers the chameleon quality of his work, as it does for many designers. But these "looks" are really only the outcomes of personal style, not the causes. The question remains: what's the Morrison-ness of a particular drift or plant combination? What's his "deep style"? To get there in a way that might make sense for a visit to the BBG addition, it may be necessary to shift the discussion to fields that offer a more evolved vocabulary for describing style – the fine arts and a little philosophy. In addition to featuring two different habitats side by side, Darrel’s BBG addition also employs two different “rhetorics,” or ways of positioning plants in the world. For the garden visitor, this creates a version of the old botanical garden conundrum – Do I pay attention to the species tags or to the design and pretty plants? Maybe both in turn, if you are patient and open minded. This seeing a thing one way or another is called “aspect seeing” by psychologists. But the best modern thinker on the nature of thinking, Ludwig Wittgenstein (1889-1951), argued that you can do one at a time but you probably cannot do both at the same time. If you try, then cognitive dysfunction on an epic scale would result, which was an intriguing prospect for Wittgenstein. 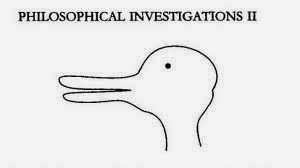 It was Wittgenstein who evoked the “ambiguous drawing” that at one moment can be “seen as” a duck, then a rabbit. But in choosing which it is, we rob it of its special and elusive quality. Darrel provokes this kind of cognitive meltdown. In one of his core design lessons, he teaches a syllogism from Experience of Nature: A Psychological Perspective, an influential 1989 work by information theorists, Rachel and Steven Kaplan. They argue that designed places need to give us four fundamental kinds of data in order to make us enjoy them: mystery, complexity, coherence, and legibility. The last, legibility, means the reassuring perception that there is a clear and safe way through and out of a place we inhabit – a common sensical perception that we can see “on the surface of things,” without reference to complicated contexts or anything outside the immediate experience. But Darrel adds a twist on legibility: Good design in his eyes also provides readable clues as to the environmental conditions – soil quality, moisture, light – in the form of which species thrive in any given spot in the garden. That sounds like we are being asked to see a plant as part of a spatial design and read it as a sign at the same time. Suddenly, what was a reassuringly legible landscape for the Kaplans becomes a much more intellectually treacherous terrain. The puzzle reminds me of the 20th century American “assemblage artist” and neighbor to the BBG in nearby Queens, Joseph Cornell (1903-1972), whose famous “boxes” created a quiet version of surrealism in the 1940s, as New York City was just beginning to steal modernist art from Europe. The Cornellian “look” is easy to recognize–random “found objects” delicately placed alongside one another, with no apparent logic or relation, but still generating a kind of intentionality and significance, seeming to refer to something else like a symbolic meaning. The trick may be that Cornell worked with cultural fragments – man-made things taken from common childhood experiences and other vaguely familiar pasts that trigger memory and create a sentimental need to find meaning, even if they lead to dead-ends and bring us back to the objects themselves, unsatisfied and anxious for resolution. Gardens and designed landscapes can function in this way too because they are composed of familiar, sensuous things that give us “response options” – they often have vivid associations that can lead us to remember and to think. Or they can be seen as abstract design dynamics – color and form and shape, allowing us to become absorbed in the complexity of the work itself. But gardens add another layer that may explain why they are different from paintings and collages: They are assembled of living things. They create interrelations not just of color and structure, memory and reference, but also of botanical and biological processes, which in turn incorporate other elements of the environment like moisture and temperature, chemical composition and bacterial decomposition. The BBG Native Flora Garden addition, February, 2014. Source: H. Wade. These aspects of a garden give us response options as well: We can interpret them as symptoms of a habitat because they follow processes of life and earth that hold true here and everywhere else. So we evaluate the strength of the created ecosystem or consider whether the garden is sustainable. Alternatively, we can sit back and watch these life processes at work because they can be compelling, in the same way that a piece of music or a film playing out over a period of time engages us. Wittgenstein’s biggest contribution to the garden is his insight that language destroys most of these options. Our very act of asking the question, “Which is this, a pretty purple, or a flower like the one from my childhood, or Symphyotrichum oblongifolium?” – this asking is an act that destroys the real experience, which is all of those associations held together at the same time. The challenge is to let it be that complex. Ten years further into the new century, what innovations are emerging from this new art form of Darrel’s? Ecologically sound design has swept the mainstream in the form of sustainability and nativism, but what about the “aesthetic richness” that Darrel also called for in his mini-manifesto? Ecological design has sought to protect pollinators and other animal diversity all along. But Darrel’s is an aesthetic evolution on this point as well as a functional one. In this context, the closeness of the BBG addition becomes an artistic choice to surround the visitor with the most experiential complexity possible, reaching beyond plants and hardscape. As visitors, how do we choose to read the sections of the garden or respond to individual plants? But also, how do we deal with the fact that we are performing a role in the living design of this garden, as thinking animals ourselves? It’s hard to make nuanced choices like these when you are integrated into a thriving meadow, or a busy Brooklyn crowd. 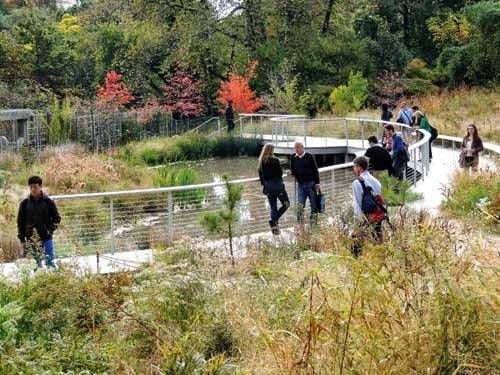 If Darrel can be said to address his own challenge from a decade ago, the Native Flora Garden addition is a new participatory kind of art form that takes “living community” to a higher level and gives the visitor more response options than ever before. Our challenge as visitors to the garden is to see it in all its complexity, even become part of the complexity, all at the same time. NYBG apparently moved away from a "habitat" garden (I heard Sheila Brady talk about it recently here in D.C) to a more "gardeny garden" (my term). But it seems to me that aside from the giant rectilinear water feature, NYBG is still in many ways a habitat garden, too, and maybe a better one than it was previously because it's concerned with planting according to the conditions of the existing site (the upper rocky ledge, the open meadow etc.,) as opposed to trying to represent (or impose ) ones from other regions. (The previous garden had a "pine barrens section", for instance, but I've never seen the earlier incarnation). I didn't have a lot of time to spend at BBG’s native garden so I'm not entirely sure what I think. I certainly like aspects. But, I wonder how the gardeners feel about these gardens. (I work as a professional gardener.) What is it like from a maintenance point of view?? Do they think they are successful? How much involvement did they have in the development of garden? It is interesting to learn what experience Morrison hopes for at BBG. Maybe some of the complexity was lost on me. And I appreciate that the habitats represented at BBG are basically of that place. I hope to return to both soon to see them in another season, and after the gardeners have had more time with them. One visit isn’t enough to form an opinion. Sarah raises a lot of good points, particularly the comparison to NYBG. A great review within a review. I live in Brooklyn and have visited the garden 3 times over the last season, which to be fair is hard to judge a garden so young, but . . . .
For me, the planting at the BBG Native Flora Garden is a mess. Both a conceptual mess and a literal mess. It lacks legibility. There are so many plants crammed in there that it loses connection with the simple native plant communities it is meant to evoke. It is what happens when one is so in love with the plants that one loses the design. I like your philosophical analogies, but I think you heap too much meaning on this garden: "cognitive meltdown" = design mess. I hope the garden will continue to be edited and refined over the next few years. It needs it. Thanks Sarah and Anonymous for taking the new native gardens at the Brooklyn Botanic Garden and New York Botanical Garden so seriously, as they both certainly deserve. They are both very young and still need time to grow to their prime, but they are already such strong statements and two very different projects. That is why I hesitate to compare the two, per se. One seeks to bring native habitat-inspired design to a point of near romantic sweep on the one hand. The other one brings our thinking and experience of natives and plant communities to a new level of self-awareness. One engages the imagination and perhaps encourages us to lose ourselves; the other reminds us that gardens are also places to think and incorporates our conscious decisions into the design experience. Aren’t both of these approaches true to the way we engage nature and respond to design? Of course everyone has a right to prefer one of these projects over the other, and to spend more time with one of the gardens. But whichever side we fall upon, I think Sarah is absolutely right in hoping to return to both for a while. I will admit that one of the prejudices behind this series of articles is my belief that New York City is a diverse enough place, with enough divergent creative and interpretive approaches floating around in it that we just have to spend more careful time with thoughtful design, of many different kinds. Another prejudice of mine is that progressive naturalistic design is the most intellectually and emotionally engaging area of landscape design today, so it is necessary to think it all through in the way that Thomas supports in Grounded Design. How, for instance, do we need to change the standard meaning of “habitat” at this point in the movement, or what does sustainability do to our expectations of maintenance, or what is our responsibility as a garden visitor in such an informed era? The last installment in this series will focus on the NYBG Native Flower Garden in spring, and I look forward to continuing this informed and passionate dialog with you. In January, I had the privilege of attending an APLD Ohio design workshop with Darrel Morrison. Darrel is great teacher and humble advocate for native plants. His design approach, refined over a decades long career, was inspiring and has fundamentally changed the way I look at my own work. You know, the post on the APLD Ohio Chapter website about this workshop really captures the depth and kindness of Darrel's teaching style. His combination of clear-thinking site analysis and a decidedly non-rational approach to creative idea development is key to Darrel's style as a designer, and just as importantly I think, as a teacher. I have not had the opportunity to hear many of Darrel's lectures, but I did discuss the process with him while researching his BBG addition. To oversimplify how I understand that approach: immersion in the inspiration habitat + analysis of its elements + emotionally driven creative response to the habitat + re-immersion at the construction site to discover opportunities there = a pretty solid approach to design and garden making. Having never seen this garden, and only glimpsed the NYBG garden last month, I can't even comment on the BBG garden. I can only thank you for this fascinating essay and "tool kit of response options," which I'll take with me when I finally see the garden. I'm not joking; I think your wide-ranging analysis--from Wittgenstein, to Cornell, to the Kaplans, et al.--is thought-provoking and a worthy companion for further study of gardens in general. I have been fortunate enough to hear Darrel Morrison speak twice in the last two years. I well remember scribbling the Kaplan's mystery, complexity, cohesiveness, legibility mantra in the margins of my program during his presentation at one event (feeling as if I'd experienced an epiphany), and at another I watched as Darrel took off his shoes and "danced" to Smetana's Ma Vlast as he drew colored swirls for a landscape design for part of the campus at Temple University in Ambler. An unusual design approach, but a rather thrilling and enjoyable one to watch. The year before, at Plant-o-Rama at BBG, he participated in a panel discussion of the then-under-construction native plant gardens at both BBG and NYBG. The only recollection I carried away from that discussion was the impression that the BBG garden would be strictly a habitat garden (with teaching primary and aesthetics a secondary concern) and that the NYBG garden would be less constrained to specific ecologies, and less overtly pedagogical, and probably would designed with more concern for aesthetics (for looking good). I now can't wait to visit both (in full growth, I hope), and the deep reading in this post makes me look forward to that with great anticipation. Thank you for your kind words, James. I envy you your Morrison classroom time. The habitat vs. aesthetic object polarity you mention may have always been one of those cases where seemingly opposite states really form a continuum, with gradations and variations all along the spectrum from one pole to the next, and with very few pure examples to be found. The theoretical question I am asking myself now (yes, another theoretical question) is, why is this such a slippery question? Is it because landscape and garden design, by virtue of their methods and media, have no choice but to always BOTH follow nature and to aestheticize it? Or is the matter getting more complicated because the rise of ecological considerations has turned habitat preservation into a headliner theme that no thoughtful design can escape and no self-aware visitor can get out of their head? Is it the underlying metaphysics of gardening or the trend-like power of a school of thought that defines our particular moment in history? Not sure. But I am increasingly sure that the habitat vs. aesthetic object dynamic is a fault line running under the most creative design solutions today, helping to create their energy and relevance. Darrel Morrison may have always known it’s a two-for-the-price-of-one deal and the BBG addition may merely be his most articulated expression, to date. It's wonderful to find people like you and Thomas who believe gardens and landscape are appropriate subjects for intellectual and aesthetic discourse. I wish we had many more thoughtful people writing like this about gardens. As a landscape enthusiast I am always searching for unusual European garden ornaments. One of my trips led me to the country side of Italy where I fell in love with the natural feel of its gardens. I came back to the US and was trying to find a company which would offer me the same sensation as I had experienced Tuscany. A friend told me about Authentic Provence, the moment I stepped into their showroom I was taken aback in awe. Their exquisite collection of French and Italian antiques were exactly what I was looking for to complement my garden. Now my garden is the show piece, through Authentic Provence's unique garden ornaments. I am now encompassed by the true Tuscan lifestyle. Visit them at www.authenticprovence.com and you will find what you are seeking. Nicely, you will find your blog.your articles are very interesting.Thanks for sharing such an informative article. The pictures of the addition look absolutely breathtaking. It looks like a nature retreat right in the middle of the city. I would go on walks there every day. Hi Claudia. You're right! Darryl's addition, and the rest of the BBG, is exactly a retreat in the middle of a city, but it also keeps that city's spirit within even its quietest corners. You hear the street traffic from the wilds of the Native Flora Garden and it makes perfect sense. It is a retreat that doesn't retreat. Visit and see what I mean. Mr. Wade, could you share the name of the plant that's in the top right corner of the picture quad captioned, "The addition to the BBG Native Flora Garden addition, January, 2014. Source: H. Wade"? I love the texture and how it curls against itself. Hi Esther. Thank you for your keen plant eye. If I am right about the photo you mean, it is Comptonia peregrina, or Sweetfern. The late winter photo is very sculptural, but at its peak, Comptonia is a deep yellow-green 2'-3' high deciduous shrub that lives up to its common name, looking very much like a fern but more adaptable to dry and thin soil in full sun. In the summer, it has a haylike fragrance and it is also extremely hardy (zone 2-6! ), native throughout the eastern US. I first met Comptonia in Acadia National Park in Maine, where it thrives in full sun to dappled shade. I love its durable, solid, but also delicate foliage and use it in drifts with Liatris aspera, and a little more functionally at the feet of Clematis virginiana along a sunny arbor. I hope you find a place for this terrific plant in your garden world too. Yes, that's the one! Thank you! Great blog, and the gardens look amazing! They will Appears fabulous. Beautiful words and phrases ough have got sheared in your post. This is great data a truly decent blog. keep it up!! !